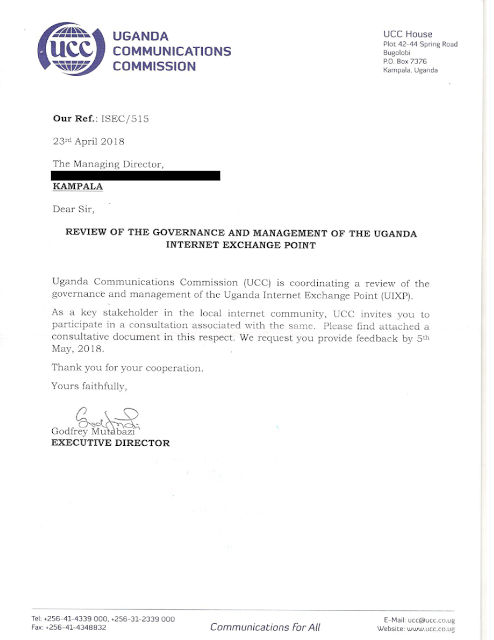 On Thursday, April 26th, a concerned network operator forwarded us a copy of a survey they received from the national telecommunications regulator, the Uganda Communications Commission (UCC), which seeks input on how the UIXP should be governed, managed, and financially sustained. We were not previously aware of this survey and are deeply concerned by its contents. Its text is inaccurate and misleading; its questions are poorly formed; and its broad dissemination indicates that the UCC is planning to attempt a top-down intervention in the UIXP's governance model and, by extension, Uganda's nascent network interconnection industry. April 2018: Cover letter for UCC survey seeking input on the how the UIXP should be governed, managed, and financially sustained. The UCC issued this survey with full awareness that the UIXP is actively and transparently working to advance its own governance reform process in collaboration with the network operator community; that the issues we need to address have not adversely impacted our growth and do not present an immediate risk to the continuity of our operations; and that the neutral not-for-profit governance model which the UIXP adopted in 2001 has become the most dominant and successful model in Africa by far. The UCC's justification for issuing this survey stems from a letter sent to them by two members of our Internet community that libelously accused the UIXP management team, Google, and Akamai of fraud and impropriety. The UCC quickly and conclusively learned that these claims were false but continued to interject in our affairs under the guise of a neutral intermediary intent on resolving a community conflict. Meanwhile, in the background, we see a rising frequency of controlling and economically damaging government interventions in the telecommunications space. Recent examples include a controversial move to reclaim and prop up the terminally ill state owned telecommunications company; a proposal to limit the number of international gateway providers; an explicit order to tax social media users in order to curtail unfavourable on-line discourse; and a directive to block all online news providers that have not been granted a national license. The government has also made multiple attempts to nationalize or directly involve themselves in the UIXP's governance in the past, including a 2014 vote by Parliament (which was never implemented) and other less formal/ethical efforts to achieve the same. They also launched a failed attempt to nationalize the .ug ccTLD and have displayed an increasing tendency to censor or block telecommunications services (including mobile money) during presidential elections and politically sensitive events. In this context, it is hard to trust that the UCC's interest in the UIXP's governance model is benevolent. 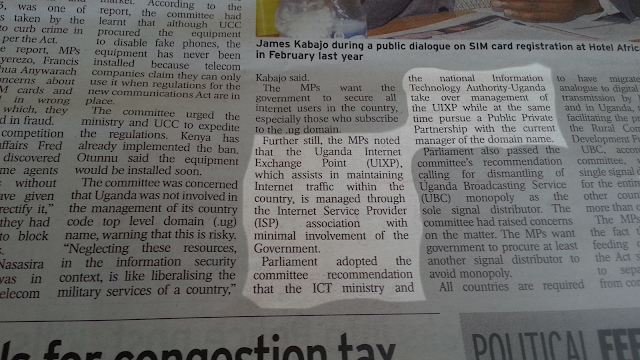 The nature of their current involvement, and this survey in particular, raises the specter of nationalization and other forms of government intervention that could ultimately deter or prohibit competition in Uganda's emerging network interconnection industry -- an outcome that would have significant long term consequences for Uganda's telecommunications market and national economy. 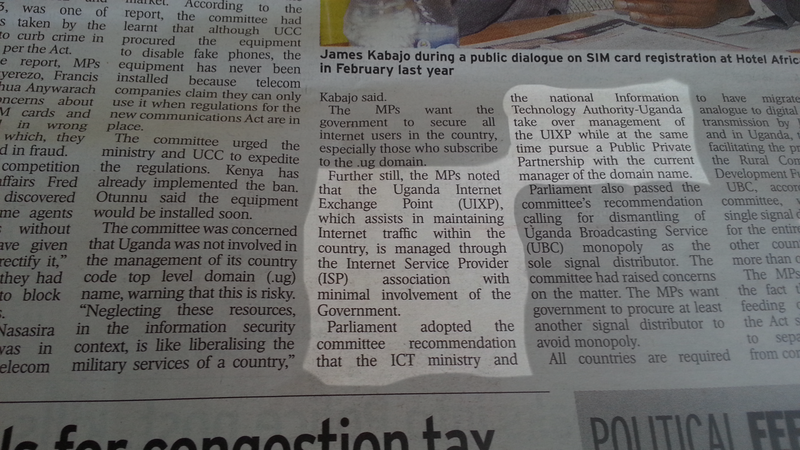 2014: Parliament adopts an ICT committee recommendation to nationalize the UIXP based on false information and without engaging UIXP management in any way. The African network interconnection industry is evolving rapidly. There are now 42 IXPs in 32 countries which carry over 400 Gbps of Internet traffic on a daily basis -- up from only 160 Mbps in 2008. South Africa, Nigeria, and Angola all now have more than one IXP operator, with other countries soon to follow. In tandem, we are starting to see the deployment of carrier neutral datacenters, large-scale content, and cloud services. In Uganda, the UIXP now interconnects 28 networks and carries over 6 Gbps of Internet traffic on a daily basis -- up from only 10 Mbps in 2008. This has made our market much more attractive to international content providers and carrier neutral datacenter investors. If we continue along this path, there will soon be enough demand for local network services to justify the entrance of Uganda's first carrier neutral datacenter and second IXP operator. This would mark a milestone in Uganda's telecommunications history and likely herald a golden era of Internet connectivity. 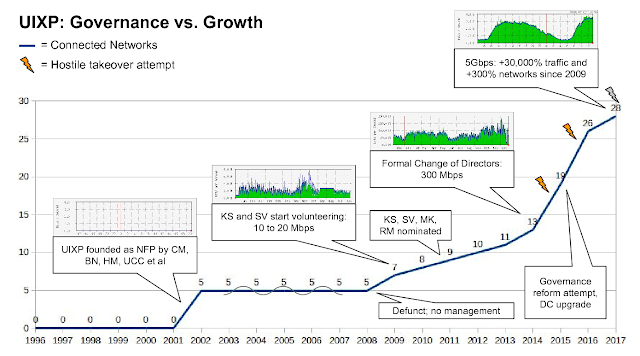 UIXP: Chart showing connected networks, traffic growth, and key governance events over time. However, expropriating our private not-for-profit company, and nationalizing our nascent industry in the process, is a great way to make sure that never happens. It would significantly increase Uganda's investment risk profile; prevent new IXPs from forming; and make carrier neutral datacenters -- which rely on network interconnection for growth -- far less viable. As a result, large content providers would need to look elsewhere for hosting (e.g. Kenya) which, in turn, would ensure that Uganda must continue to pay other countries for access, thereby keeping end-user prices high and service quality low. In our view this is a very real possibility that threatens everyone's interests. We therefore call on all network operators and other recipients of the UCC survey to take this into account when considering if, and how, to respond. We further call on all network operators to more actively participate in our own sustainability and governance reform process. It should be clear to all by now that the only good way forward is to work together.